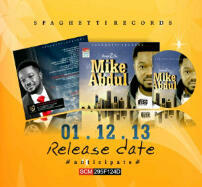 Gospel music minister Mike Abdul has announced December 1st 2013 as the release date of his new album. The album titled “Good to Go” will have 12 tracks in it including the hits such as “Morire”, “Ready to Praise”, “Serve You Forever” amongst others. The midnight Crew officially announced their decision to let each other follow solo paths while still working together under the vision of the group in a statement released on the Midnight Crew’s official website some weeks back while celebrating their 12th year anniversary. Mike Abdul and Patricia Uweje-King, members of the group happened to be the first amongst the four-man group to put out solo projects. OFFICIAL ALBUM RELEASE STATEMENT (GOOD 2 GO by Mike Abdul). “I am good, that is why i am here. The Creator made sure all He made was good before He could let them go. He saw to it that Mike Abdul was good enough to be on earth, good enough to fulfill the dominion mandate and He said to Mike Abdul; “you are good, you can go”. I put it to you that you are here because you are God’s standard, you are a product for a function and the supreme intelligence has put you together to function in the capacity of you, come rain, shine, storms or calm. I believe that everyone is called to a purpose, I also believe that we are all endowed with the capacity to achieve purpose. I am certainly endowed enough to be the manifestation of the best I can ever be. Growing up, some natural tendencies began to unfold and I made several discoveries of me, I found innate abilities that I never rehearsed or trained for. People admire me when I do certain things and they say I am talented. I got several approvals that established the discovery of me. I am gifted and I choose to dedicate the gift to the one that gave it to me. In my walk through my path, I met great people who made the walk worth the input, people who helped to find my place. Iron sharpens iron so I still roll with the best team. A new life has just began for me and I am so glad to start living it. I wish to introduce my debut album to you. I have titled it “Good 2 Go”, the name of a beginner. It is a twelve track album put together by my experience with God and man. I featured seven other music artists who also shared their experiences and blessed me with their input. Big thanks to MoniQue, A’dam, BNG, David Jones David, PV Idemudia, Temi Susan Myles and FLO, thank you for blessing God’s people. 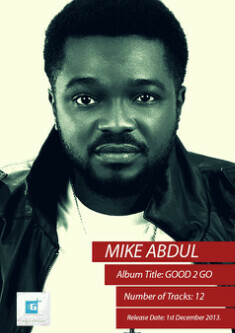 Official release date of GOOD 2 GO by Mike Abdul: 1st December 2013. Marketing and Distribution : IYKE THE DON ENTERTAINMENT LIMITED. I dedicate this album to JESUS, the one who gave me utterance. “When I die, it will only mean that I am done but I am still here, so there is more to be done. Thank you Lord Jesus for this office, I pray my days please you”. Mike Abdul has further shot a video to his work “Morire” featuring label signee Monique. It’s no doubt that Mike Abdul is ‘good to go’, each of his releases have enjoyed rave reviews online and on other media platforms. The album should be the icing on the cake. I am gOOd, that is why i am here. The Creator made sure all He made was gOOd before He could let them go. He saw to it that Mike Abdul was gOOd enough to be on earth, gOOd enough to fulfill the dominion mandate and He said to Mike Abdul; “yOu are gOOd, yOu can gO”.